Gucker, Corey L. 2009. Eragrostis curvula. In: Fire Effects Information System, [Online]. U.S. Department of Agriculture, Forest Service, Rocky Mountain Research Station, Fire Sciences Laboratory (Producer). Available: https://www.fs.fed.us /database/feis/plants/graminoid/eracur/all.html . The scientific name of weeping lovegrass is Eragrostis curvula (Schrad.) Nees (Poaceae) [8,56]. Information on state-level noxious weed status of weeping lovegrass in the United States is available at Plants Database. Weeping lovegrass is a nonnative species that occupies a relatively large range in the United States. Weeping lovegrass populations are sporadic along the western US coast, in the southern half of the continental states, along the eastern US coast, and in Hawaii and Puerto Rico. In the continental states, populations occur as far north as Illinois and Ohio [8,28]. Weeping lovegrass is most common in Arizona, New Mexico, Oklahoma, and Texas [37,47] but is "becoming common" in New Jersey and Pennsylvania . Generally, weeping lovegrass is most common in those areas where it was intentionally planted. For a map of the scattered weeping lovegrass populations throughout the United States, see the Grass Manual on the Web. Weeping lovegrass is native to southern Africa [8,123], and several ecotypes from different parts of South Africa were seeded and have become established in the United States [23,26]. Throughout the United States, weeping lovegrass was planted most often for erosion control and livestock forage [37,57,103,123,126]. However, it has also been used as an ornamental , in pastures , in mine reclamation [80,110], along highways [50,61], and on severely disturbed sites . These topics are discussed more in Management Considerations. Weeping lovegrass seed introduced to the United States was collected from several different African ecotypes. These ecotypes are recognized as cultivars in the United States. The earliest collection of weeping lovegrass seed, from north-central Tanzania, occurred in 1927. This ecotype ('A-67') was planted and established on 2,000,000 acres (800,000 ha) in Oklahoma and northwestern Texas from 1940 to 1980. Other ecotypes ('Emerlo' and 'Morpha') were collected near Pretoria, South Africa, in the 1940s and 1950s and were introduced in the United States in the 1950s and 1960s. The last ecotype ('Renner') was collected from Lesotho, South Africa, and introduced in the United States in 1972 [23,26]. Ecotypes or cultivars are also discussed briefly in Aboveground description and Site Characteristics. Weeping lovegrass was first planted in the United States in Stillwater, Oklahoma, in 1935. By 1965, it was growing in New York, and as recently as 1990, weeping lovegrass was seeded in southeastern Arizona. Throughout the southwestern and south-central United States, weeping lovegrass was planted extensively from 1936 to 1945 for erosion control . In the southeastern United States, seeding of weeping lovegrass began in the 1940s. It was planted on a wildlife refuge in McBee, South Carolina, in 1942 (Ingram, personal communication cited in ) and on severely eroded, infertile, acidic sites in southeastern Tennessee, beginning in 1941 . Beginning in the 1960s, weeping lovegrass was seeded along highways by the New York State Department of Transportation. Seeding occurred "en masse" in the 1970s and 80s on Long Island Expressway and Sunrise Highway in Suffolk County . 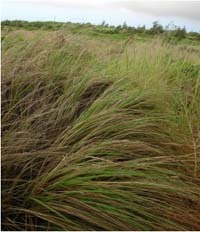 After 1988, severely disturbed sites were seeded with weeping lovegrass in Fort Benning, Georgia,  and on Kaho'olawe Island, Hawaii . As late as 1990, areas burned by a July wildfire in southeastern Arizona were seeded with weeping lovegrass. By 2002, weeping lovegrass monocultures had established to the virtual "exclusion of other native graminoids and forbs" . The use of weeping lovegrass in revegetation and the potential for these projects to contribute to its spread are discussed more in Introduction and spread. Weeping lovegrass occupies forest edges and pine-oak (Pinus-Quercus spp.) and mixed hardwood woodlands throughout its nonnative range . In the southwestern United States and southern Great Plains, weeping lovegrass is common in Arizona chaparral , shortgrass prairie , desert shrublands, pinyon-juniper (Pinus-Juniperus spp.) woodlands, and disturbed areas . In Oklahoma, a weeping lovegrass herbaceous association is recognized due to the extensive and persistent stands . Persistence of weeping lovegrass differed by vegetation type in Arizona's Tonto National Forest. In 1945, weeping lovegrass was seeded in a semidesert shrubland type dominated by honey mesquite (Prosopis glandulosa), catclaw acacia (Acacia greggii), paloverde (Parkinsonia spp. ), and spiny hackberry (Celtis ehrenbergiana), a semidesert grassland type dominated by western wheatgrass (Pascopyrum smithii), blue grama (Bouteloua gracilis), and sideoats grama (B. curtipendula), and a pinyon-Utah juniper (J. osteosperma) type. Weeping lovegrass persisted in the semidesert shrubland for less than 20 years and in the pinyon-juniper type for less than 30 years. Weeping lovegrass remained in the grassland type for 30 years or more . Botanical description: This description covers characteristics that may be relevant to fire ecology and is not meant for identification. Keys for identification are available (e.g., [8,44,49,123]). Aboveground description: Weeping lovegrass is a large bunchgrass that is generally a long-lived perennial [3,8,49] but in northern US habitats may be an annual . Weeping lovegrass may reach 75 inches (190 cm) tall, and the basal crown diameter of isolated plants may reach 15 inches (38 cm) [95,123]. Leaf blades are narrow, stiff, finely pointed, and measure up to 26 inches (65 cm) long and 3 mm wide. Leaf blade margins are often rolled inward [8,28,81]. Weeping lovegrass generally produces open, nodding panicles. Inflorescences may measure 16 inches (40 cm) long and 6 inches (15 cm) wide. Spikelets may reach 1 cm long and contain 4 to 15 florets [8,47,123]. Seeds are rather long, up to 1.7 mm, and flattened [8,47,88]. Weeping lovegrass ecotypes and/or cultivars described in the Distribution and Occurrence section typically differ only in leaf size, palatability, "vigor", and/or cold tolerance [23,26]. Cultivars are likely best identified through historical planting records and not through morphological differences. Belowground description: Weeping lovegrass produces an extensive thick mat of roots, which have made it useful for erosion control [3,58]. Shoop and McIlvain  report that vertical roots may reach 15 feet (4.6 m) deep and spread out 3 feet (1 m) on sandy soils. Roots often fill all the surface soil space between plants. The first roots produced by weeping lovegrass seedlings are large and generally grow straight down; these primary roots develop 30 to 60 fine rootlets per inch of primary root length. Seedling roots grow rapidly; in the first month of growth, weeping lovegrass roots averaged of 0.54 inches (1.4 cm) of growth per day. Maximum seedling root growth in a single day was 2 inches (5 cm). In the field, a 2-year-old weeping lovegrass plant produced 600 to 800 main roots that reached a maximum depth of over 6 feet (2 m) and a maximum lateral spread of over 10 feet (3 m) . In the south-central United States, weeping lovegrass produces green growth 2 to 4 weeks before most native grasses. Growth begins in the spring when minumum temperatures exceed 50 °F (10 °C) [26,34]. In Woodward, Oklahoma, weeping lovegrass produced some green growth in March, but growth was slow until April . In Oklahoma, weeping lovegrass may be green as late as mid- to late November . Weeping lovegrass flowering dates are earliest in the eastern United States (April-June) [21,88]. In the central United States, weeping lovegrass typically flowers from May to August [37,47], which is earlier than the flowering dates reported for the western United States (July-October) [28,81]. Additional information on seasonal development is presented in Seed production. Weeping lovegrass reproduces by seed. Although a type of vegetative regeneration during wet, warm weather is described in a review by Crider , this process was not described elsewhere. See Vegetative regeneration for details. Pollination and breeding system: Weeping lovegrass produces seed through self fertilization of sexual plants or by apomixis [41,113]. Apomixis is considered more common than sexual reproduction by Voight and Bashaw , but Fryxell  reports that weeping lovegrass only reproduces sexually through self-fertilization. Seed production: Prolific and early seed production is common in weeping lovegrass stands. Given favorable climate and site conditions, weeping lovegrass may flower in its first year . During studies conducted in Oklahoma, established and actively managed weeping lovegrass stands occassionally produced 2 seed crops per year: a large crop in late June and a much smaller crop in September or October. These stands were fertilized and irrigated . Weeping lovegrass panicles may produce 300 to 1,000 seeds . Information on flower production by first-year plants is also presented in Seedling growth. Several factors may affect weeping lovegrass seed production, although quantitative information on this topic is sparse, and studies were often conducted in actively managed stands. Shade can decrease seed production . Moist conditions and/or high nitrogen levels may increase seed production . In a review, Crider  suspects that high humidities and high temperatures may limit seed production, because weeping lovegrass seed crops in southern Texas and southern Florida are typically small. High temperatures and low humidities or low temperatures and high humidities are thought to increase seed production, because seed production is often high in the southwestern United States and the Pacific Northwest. Increased moisture and soil fertility are also associated with increased weeping lovegrass seed production. In Woodward, Oklahoma, weeping lovegrass produced 320 to 450 lbs of seed/acre on an irrigated site and 60 to 140 lbs of seed/acre on a nonirrigated site. On poor, badly eroded soils, just 50 to 100 lbs of seed/acre was produced . Seed dispersal: Weeping lovegrass seeds are small but lack appendages that aid burial or long-distance wind dispersal , so short-distance seed dispersal is primarily the result of gravity and wind. Dispersal of weeping lovegrass seed in flood waters was observed on the Jornada Experimental Range . Although seed dispersal by animals was not specifically reported, seed tranport in animal fur, feather, or hooves seems possible. Seed bank studies (below) suggest that although weeping lovegrass seed is not adapted for long-distance dispersal, seeds have moved to nearby sites. Seed banking: In the following studies, weeping lovegrass seed was recovered from soil samples but persistence of these seeds in the seed bank was unknown. In Arizona's Oracle State Park and Appleton-Whittel Research Ranch, weeping lovegrass made up 17% of the relative abundance of seedlings emerging from soil collections. Weeping lovegrass seed was abundant in the litter layer and in the top 2 inches (5 cm) of soil. Average seed number was not significantly different between the litter layer, 0- to 0.8-inch (2 cm) depths, or 0.8- to 2-inch (2-5 cm) soil depths but was greatest (slightly >1,000 seeds/m²) in the top soil layer. Weeping lovegrass seedlings also emerged from soil collected from sites where it did not occur in the aboveground vegetation . In central Arizona, the greatest number of weeping lovegrass seedlings emerged after scarification of soil samples collected beneath Pringle manzanita (Arctostaphylos pringlei). Weeping lovegrass seedlings also emerged from soil samples that were burned, had their litter layer left intact, or had their litter layer removed. Intact soil samples were treated after they were removed from the site . For additional information on weeping lovegrass seed survival on burned sites, see Postfire seed survival and seedling establishment. Germination: Weeping lovegrass seeds germinate best when temperatures are warm, seeds are on the soil surface, and/or after 2 consecutive days of moisture. Seeds germinate in light or dark conditions. Germination of weeping lovegrass on burned sites or following high temperature or smoke treatments is discussed in Fire adaptations and plant response to fire. Temperature and light: Increased temperatures are typically associated with increased weeping lovegrass germination. After 12 days in controlled conditions, germination of weeping lovegrass was 2% to 96% at temperatures of 59 to 86 °F (15-30 °C). Germination of the 2 weeping lovegrass cultivars increased with each 3-degree increase in temperature . Weeping lovegrass seeds collected from New South Wales, Australia, failed to germinate at alternating temperatures of 36 and 50 °F (2/10 °C). Germination was 69% to 91% when temperatures alternated between 63 and 100 °F (17/40 °C) and 45 and 68 °F (7/20 °C). Germination was best (91%) at alternating temperatures of 68 and 100 °F (20/40 °C) . Weeping lovegrass seed failed to germinate in the greenhouse when soil temperatures were 100 °F (38 °C) , suggesting that there are minimum and maximum soil temperature thresholds for weeping lovegrass germination. In other studies, researchers estimated that weeping lovegrass germination requires temperatures above 51.4 °F (10.8 °C)  and that dormancy may be induced after 1 to 2 weeks with partial darkness and temperatures below 64 °F (18 °C) . The importance of light in weeping lovegrass germination decreased with increased storage time for seeds collected in Wagga Wagga, Australia. About 50% of seeds germinated immediately after harvest; the rest germinated within a month of harvest. Although germination was generally better in the light than in the dark, after 56 months of storage, weeping lovegrass germination was 56.5% in the light and 57.5% in dark . Burial: During field studies, weeping lovegrass seed on the soil surface germinated best . Thick litter and burial by more than 2 inches (5 cm) of soil may severely limit emergence . In silty clay loam and sandy loam soils in southeastern Arizona, weeping lovegrass seedling emergence decreased with increasing planting depths. Emergence was 71% for seed on the soil surface, 47% at 0.2-inch (0.5 cm) depths, and 24% at 0.8-inch (2 cm) depths. Emergence was greater in sandy loam than in silty clay loam . Moisture: Greenhouse and field studies suggest that the amount of moisture may not be as important as duration of moisture to weeping lovegrass seed germination. In the greenhouse, 2 consecutive days of moisture were required for emergence when soil temperatures were 75 or 86 °F (24 or 30 °C). Emergence rate decreased as the number of dry days between moisture applications increased (r² =0.88 at 86 °F (30 °C) and 0.99 at 75 °F (24 °C)), and earlier emerging seedlings survived longer than later emerging seedlings. In the field in Garza County, Texas, weeping lovegrass failed to emerge from dry sandy soils 10 days after 11 mm of rain, but seedlings did emerge after 2 consecutive days of rain (19 mm total) . In West Texas when the temperature was 75 °F (24 °C), 2 consecutive days of at least 0.6 inch (15 mm) of moisture were required for weeping lovegrass germination of at least 50%. Once seedlings emerged, additional moisture was required within 2 days for seedlings to survive at least 7 days . Laboratory studies found decreases in weeping lovegrass seed germination as soil water potential decreased; however, results of these studies are difficult to compare due to differences in methodology. When weeping lovegrass seeds were planted in clayey soil and incubated at 70 °F (21 °C), emergence was 46% at a soil water potential of -0.03 MPa, and 39% when the soil was drier (-0.3 MPa soil water potential) . Germination of weeping lovegrass seeds collected from New South Wales, Australia, decreased as water potential decreased. Seeds were placed on filter paper moistend with deionized water mixed with varying amounts of polyethylene glycol to adjust water potential. Weeping lovegrass germination rates were approximately 70% at a water potential of -0.5 MPa, 20% at -1.0 MPa, and 0% at -1.5 MPa . Seedling establishment and plant growth: Several anecdotal references report that weeping lovegrass establishes easily from seed and that seedlings show "strong vigor" and provide ground cover rapidly [4,52]. Seedling survival and growth may be reduced in clay soils, drought conditions, and by interference from other species. Seedling survival: Weeping lovegrass seedling survival in field studies varies widely. Nearly 3 years after summer transplanting of 9-week-old weeping lovegrass seedlings in a Sonoran Desert mixed shrubland in southeastern Arizona, survival averaged 22% . Two years after 6- to 8-week-old weeping lovegrass seedlings were planted in southern Australia sites, survival averaged 92.9%, even though conditions were "very hot and dry" at many sites in the second year. Although survival was high, recruitment was low . In the laboratory, germinated weeping lovegrass seeds did not survive 3 days on dry filter paper . Seedling growth: In the greenhouse, weeping lovegrass seedling dry weight averaged just 3 mg, 90 days after seeding. This growth was much slower than that of other nonnative pasture seedlings, including subterrranean clover (Trifolium subterraneum), common tussock grass (Poa labillardieri), and bulbous canarygrass (Phalaris aquatica), which averaged 18 to 78 mg .
Weeping lovegrass seedling development and flowering can vary with site conditions. In west Texas, weeping lovegrass seedling establishment was classified as "good" on sandy soils, "fair" on silty soils, and "poor" on clayey soils . Weeping lovegrass growth and reproduction were better on fine loams than on fine sands when 3 sites in Texas were compared. Seedling growth and reproduction were lowest in Garza County, although annual precipitation was greatest at this site (see table below). Researchers noted that poor seed bed preparation and competition from coastal sandbur (Cenchrus spinifex) plants limited weeping lovegrass growth in this area . In a follow-up study in Garza County, field densities of up to 65 coastal sandbur plants/m² did not affect weeping lovegrass seedling survival for up to 6 months after seeding. Presence of coastal sandbur, however, did significantly (P<0.05) reduce herbage and seed head production of weeping lovegrass . In a greenhouse study, extracts of coastal sandbur and sand shinnery oak (Quercus havardii) did not significantly affect weeping lovegrass germination percentages or seedling shoot growth but did significantly (P<0.05) reduce weeping lovegrass seedling root growth. Extracts of coastal sandbur litter reduced seedling root growth 21% compared to the control, while sand shinnery oak extracts reduced root growth by 92% . Vegetative regeneration: Reproduction of weeping lovegrass by vegetative means has only been described in one reference. Generally weeping lovegrass vegetative regeneration occurs only when stems are damaged or removed by grazing or fire. In a review, Crider  describes limited asexual reproduction by weeping lovegrass, but other sources have not. Crider reports that new stems may form at nodes on the stem rather than at the usual basal nodes. During warm wet weather, these new stems may root in the litter surrounding the crown and become detached from the parent plant . Barkworth and others  noted that weeping lovegrass forms "innovations at the basal nodes" but that plants are not rhizomatous. It is common for weeping lovegrass clumps to experience central stem death if ungrazed or unburned for 10 years or more. An accumulation of litter restricts tiller production at the center of undisturbed, mature plants , possibly because limited light within the interior of the tussock limits tiller recruitment . During drought conditions, however, moisture is also important. Soil water content directly beneath clumps with open interiors was significantly (P<0.05) lower than that found at the tussock's periphery, which could promote outward tiller expansion. In a 10-year-old weeping lovegrass stand near Lubbock, Texas, tiller recruitment was stimulated by removing litter from the center of plants. Interior tiller recruitment was significantly greater (P<0.005) for plants with litter removed than for control plants. However, the results were opposite when litter removal was paired with defoliation. Interior tiller recruitment was significantly greater (P<0.001) for plants clipped to a 6-inch (15 cm) height with litter intact than for clipped plants with litter removed . Weeping lovegrass is described most often along roadsides, near gardens, in pastures and fields, on disturbed sites, and at forest and woodland edges throughout its nonnative US range [8,28,49,88,133,134]. Climate: In weeping lovegrass' native African range, average monthly minimum and maximum temperatures are 50 to 64 °F (10-18 °C) and 77 to 86 °F (25-30° C), respectively. Winters are cold and dry, and annual precipitation averages 20 to 47 inches (500-1,200 mm). More than half of annual precipitation falls during the growing season . Several rangeland revegetation guides provide a range of low temperature and precipitation tolerances for weeping lovegrass. In a review, Crider  reports that closely packed basal stems provide substantial protection of meristems from cold temperatures and droughts. Others report that hard freezing in late April or early May can cause weeping lovegrass mortality . Some report that plants do not persist in areas where temperatures often fall below 0 °F (-18 °C) , although plants may survive -11° F (-24 °C) in soils with "adequate" moisture . Seeding guidelines for desert grasslands in southern Arizona, suggest that weeping lovegrass seeding success and persistence are best on sites receiving at least 18 inches (460 mm) of precipitation annually . Weeping lovegrass is unlikely to persist on sites receiving less than 15 inches (380 mm) of annual precipitation . It is possible that temperature and precipitation minimums for weeping lovegrass survival vary among different ecotypes or cultivars. Alderson and Sharp  reported that the 'A-67' cultivar is more cold tolerant than other cultivars and grows best where annual precipitation exceeds 14 inches (350 mm). Cultivar 'A-84' grows on sites receiving at least 12 inches (300 mm) of annual precipitation. In the United States, weeping lovegrass is most productive on sites where minimum and maximum temperatures average 32 to 86 °F (0-30 °C) and summer precipitation averages 16 to 39 inches (400-1,000 mm) [23,26]. However, in Beltsville, Maryland, weeping lovegrass plants were not injured by low temperatures of -16 °F (-27 °C), and plants survived temperatures of -20° F (-29 °C) near Deansboro, New York. In "heavy" soils in Woodward, Oklahoma, though, plants were winter killed at temperatures of 0 °F (-18 °C) . Elevation: In East and South Africa, weeping lovegrass occupies sites between 2,300 and 5,740 feet (700-1,750 m) . In the United States, weeping lovegrass occurs from sea level in the East to over 7,000 feet (2,100 m) in the Southwest [8,119]. Weeping lovegrass occurs at elevations below 1,600 feet (500 m) in California , at less than 4,990 feet (1,520 m) in Utah , and at elevations of 2,850 to 3,770 feet (870-1,150 m) in the Grand Canyon region . In western Oklahoma and northern Texas, weeping lovegrass occurs at 1,000 to 3,300 feet (300-1,000 m) . Soils: Weeping lovegrass grows best in well-drained, relatively fertile, nonsaline, sandy to clay loam soils [27,33]. It does not tolerate standing water . Most often weeping lovegrass occurs in sandy soils [47,88]. In a greenhouse, weeping lovegrass seedling emergence was greatest from sandy loam (54%) when compared to Pima silty clay loam (47%) and Sonoita silty clay loam (22%). The clay of the Pima soils was 60% montmorillionite and for the Sonoita soils was 80% kaolinite . Weeping lovegrass tolerates salinity and a wide pH range. A review reports that weeping lovegrass is very salt tolerant , and in a short-term greenhouse study, weeping lovegrass production after 20 days of treatments with 180 mol NaCl/m³ was 82% of that of nonsaline treatments . In loamy soils in Garza County, Texas, weeping lovegrass grew in areas with a pH of 8.4 , and in a controlled study, researchers found that weeping lovegrass seedling growth was not reduced at pH 4 but was reduced at pH 3 . In its native African grassland habitats, weeping lovegrass is most common in the seral stage just before "climax" in East and South Africa . A review describes grassland succession in South Africa. Initially sites are colonized by "weedy" vegetation, which is then replaced by short-lived perennials, which are replaced by short-lived grasses. In the next successional stage, the long-lived grass stage, weeping lovegrass is common, until its eventual replacement by the climax red grass (Themeda trianda). After top-killing disturbances, such as fire, in the climax grassland, weeping lovegrass is often dominant . Weeping lovegrass is tolerant of partial shade, and in Beltsville, Maryland, weeping lovegrass established and grew in "almost" complete shade . However, within 5 years of a fire near Globe, Arizona, increases in shrub live oak (Q. turbinella) appeared to reduce weeping lovegrass abundance. Basal cover of weeping lovegrass was inversely proportional to shrub live oak crown cover. In experiments where more than 50% of shrub live oak cover was removed, weeping lovegrass cover increased for up to 3 years . Whether or not weeping lovegrass abundance was reduced by shrub live oak shading is unclear. It is possible that competition for root space or other interference was more important (see Belowground description). In its nonnative US habitats, weeping lovegrass has been planted in many disturbed sites (see sections on Distribution and Occurrence and Introduction and spread). It persists on harsh sites and recovers rapidly following defoliation. In the desert grasslands of Sonita Valley, Arizona, cattle grazing seemed to encourage establishment and growth of weeping lovegrass and Lehmann lovegrass. Researchers tracked changes in lovegrass cover in an area where they were seeded; in an ungrazed, unseeded area; and in a grazed, unseeded area. Lovegrass cover generally increased over time in all areas, but over the 22-year study, increases were 2.5 times greater on grazed, unseeded areas than on ungrazed, unseeded areas even though the ungrazed, unseeded area was closest to the seeded area . Immediate fire effect on plant: Weeping lovegrass is often only top-killed by fire and sprouts soon after burning . In a review, Crider  reports that weeping lovegrass' tightly packed basal stems are protected from high fire temperatures; however, heavy accumulations of dead fuel at the base of the plant and at the root crown may increase duration of burning or residence time, leading to more severe injury or death [34,92]. Fire adaptations and plant response to fire: Established weeping lovegrass plants typically sprout following fire; even small seedlings established in the previous growing season often survive fire . Seedling establishment on burned sites is likely. Weeping lovegrass seedlings emerged from soils collected on burned sites in Arizona [45,77], and when it was intentionally seeded on a burned site in Arizona's Tonto National Forest, a near monoculture of weeping lovegrass established . Removal of litter by fire may increase seedling establishment, which is restricted by thick litter; however, some litter benefits established plants by reducing evaporation . Weeping lovegrass abundance and/or productivity are generally greater on burned than unburned sites within a year of spring or winter fires [59,74,84,100], although recovery to prefire levels took 2 years following a summer fire in Santa Cruz County, Arizona . Weeping lovegrass persists on sites burned repeatedly [42,119], although abundance may be reduced by annual burning . Seed production by burned weeping lovegrass plants often exceeds that of unburned plants [68,71,73,74]. However, all postfire reproduction studies have occurred following spring fires, so they may not reflect the postfire response in other fire seasons. Weeping lovegrass recovery following fire has been studied in both its native and nonnative habitats. Differences in recovery were not apparent between native and nonnative habitats. Postfire seed survival and seedling establishment: Several studies report that weeping lovegrass seed can survive fire and that successful seedling establishment on burned sites is common. In controlled experiments, weeping lovegrass seed germination was not affected by 2-minute heat treatments of 100, 180, and 250 °F (40, 80, and 120 °C). Germination of seeds soaked in smoke water and then heated to 250 °F (120 °C) was significantly (P=0.004) greater than germination of untreated control seeds, but average germination for all treatments was low (10.2%). Smoke water was produced by bubbling smoke created from burning forbs and grasses through distilled water . When weeping lovegrass seeds were placed on moist filter paper, germination was more rapid for seeds heated for 24 hours at 160 °F (70° C) than for untreated control seeds . Weeping lovegrass seed germinated following burning in Arizona. Two weeping lovegrass seedlings emerged from burned litter and soil layers collected beneath pringle manzanita shrubs in central Arizona. Researchers collected samples of intact litter and soil layers (up to 2.5 inches (6.3 cm)) that were burned under controlled conditions. Burning produced temperatures above 400 °F (200 °C) in the litter layer and up to 250 °F (120 °C) in the soil. Weeping lovegrass was not observed in the study area at the time of soil collection but had been seeded in an ajacent area 2 months before soils were collected . Given the recent introduction of weeping lovegrass seed to the area, it is likely that seed occurred in the litter layer at the time of burning. On the Appleton-Whittell Research Ranch in Santa Cruz County, Arizona, the average density of weeping lovegrass seed was 145 seeds/m² about a month after the Ryan fire burned the area on 30 April 2002. In August 2002, October 2002, and June 2003, the average density of weeping lovegrass seeds on burned plots was 19, 245.5, and 258.0 seeds/m², respectively . While the seedlings that emerged from 1-month-old burned plots were likely seed bank survivors, those collected from the 4th postfire month to the 1st postfire year may have been produced by regrowth on burned sites. Weeping lovegrass readily established and over time became a monoculture on burned sites in Arizona that were seeded with weeping lovegrass after fire. When weeping lovegrass was seeded in chaparral vegetation in east-central Arizona following a late summer fire that consumed all aboveground vegetation and left only charred shrub live oak and pointleaf manzanita (Arctostaphylos pungens) stems, percent composition and density of weeping lovegrass increased in each postfire year up to the 5th postfire year. Many plants produced seed in their first year of growth . Weeping lovegrass was seeded on burned ridges, slopes, and mesas in the Tonto National Forest after a 1990 July wildfire. By the 12th postfire year, weeping lovegrass occurred in monocultures "virtually to the exclusion of other native graminoids and forbs" . While weeping lovegrass may have been present on burned sites before the fire, presence and/or abundance were not reported. Postfire response in nonnative habitats: While many studies report rapid recovery and increased production, abundance, and reproduction of weeping lovegrass on burned sites, all of these studies occurred within a small portion of weeping lovegrass' nonnative US range: Arizona, Oklahoma, and Texas. It is unknown how well fire studies conducted in these areas relate to other areas. While weeping lovegrass typically increased on burned sites in Arizona, recovery time varied. Weeping lovegrass frequency and biomass were lower before than 8 months after a March prescribed fire in the Tonto National Forest in central Arizona. Prefire frequency of weeping lovegrass was 19%, while postfire frequency was 22%. For the same time period on the unburned site, weeping lovegrass frequency decreased from 19% to 11%. On north slopes, weeping lovegrass biomass was not different before and 8 months after the fire, but on south slopes, weeping lovegrass produced 141 dry pounds/acre in the growing season before fire and 306 dry pounds/acre 8 months after fire . It took 2 years for lovegrasses (weeping lovegrass and Lehmann lovegrass) to reach prefire cover levels after a wildfire burned lovegrass-dominated plots on the Sonoita Plain in Santa Cruz County, Arizona. The wildfire burned on 16 July 1987, when conditions were hot, dry, and very windy. The fire consumed virtually all aboveground vegetation. Two years after the fire in an adjacent native-dominated grassland, lovegrass cover was 0% on unburned plots and almost 4% on burned plots , suggesting that native grasslands may have been more invasible after fire. While most of the observations suggested that fire was beneficial to weeping lovegrass growth and survival, researchers noted some exceptions. While reduced litter on burned sites may increase the potential for seedling establishment, it could also increase evaporation and decrease moisture availability for established plants. Although earlier growth on burned sites increased weeping lovegrass' growing season, it also made plants more vulnerable to spring frost . Weeping lovegrass cover was reduced for at least a year following an April prescribed fire in a weeping lovegrass monoculture in Lynn County, Oklahoma. Weeping lovegrass canopy cover was significantly (P<0.05) lower on burned than unburned plots 3 months and 15 months after fire. Cover averaged 49.6% on burned plots and 84.8% on unburned plots 3 month after fire and averaged 65.1% on burned and 93.6% on unburned plots 15 months after fire . During prescribed fire studies in Texas, researchers found that fireline intensity did not affect weeping lovegrass height or seed production and suggested that duration of smoldering or residence time in grass clumps may better predict damage and recovery on burned sites. After multiple study plots were burned in spring head fires or backfires in Brownfield, Texas, researchers detected no relationship between fireline intensity and weeping lovegrass height or seed stalk production in the first postfire growing season. The tallest weeping lovegrass plants (average: 33 inches (84 cm)) with the greatest seed stalk production (128/m²) occurred on sites burned by a head fire with a fireline intensity of 5,569 kW/m. The shortest weeping lovegrass plants (7 inches (17 cm)) occurred on sites burned by a head fire with a fireline intensity of 5,824 kW/m; seed stalk production was lowest (4/m²) after a backfire with a fireline intensity of 202 kW/m. In the first postfire growing season following the fire with the greatest fireline intensity (12,603 kW/m), weeping lovegrass averaged 21 inches (53 cm) tall and produced 112 seed stalks/m² . Although fireline intensity did not relate to weeping lovegrass height and seed stalk production, other relationships were found. Yield was lowest on plots burned latest in the spring (April 2 and April 15). When fuel moisture and soil moisture were increased by 1%, yield increased by 43 kg/ha and 94 kg/ha, respectively. Yield and plant height were reduced by 754 kg/ha and 3 inches (8 cm), respectively, when standing green fuel load was increased by 10%. Increased litter around the base of the plant would likely increase the duration of high temperatures and impact postfire recovery . Studies in Texas suggest that weeping lovegrass production may increase after winter or spring burning. At Texas Tech, weeping lovegrass production was 14% greater on winter-burned than unburned plots . When fall- and spring-burned plots near Brownfield, Texas, were compared, weeping lovegrass produced the greatest number of reproductive culms on spring-burned plots. On the unburned site, weeping lovegrass produced 21 reproductive culms/acre. On sites burned in September, there were 27 reproductive culms/acre; on sites burned in November, there were 86 reproductive culms/acre; and on sites burned in March there were 185 reproductive culms/acre . Time since fire was not reported, but given the dates of the fire and the publication, reported values probably represent the first postfire year. *Reproductive tiller production on burned plots peaked on 6 August in 1996 and on 11 June in 1997. Along highways near Perth, Australia, weeping lovegrass frequency was unchanged after a fall prescribed fire in sclerophyll woodlands. Before the fire, weeping lovegrass occurred on 15 of 30 plots, and 6 months and 30 months after the fire, weeping lovegrass occurred 14 of 30 plots . Fire behavior was not described. Postfire response in native habitats: In South Africa, weeping lovegrass plants may be partially damaged by fire , but plants generally survive repeated and even annual fire, although abundance may be reduced . After an accidental fire on 27 August 2000 in a perennial grassland in Zastron, South Africa, substantial damage to weeping lovegrass bunches was rare. Two months after the fire, 83.3% of weeping lovegrass tufts suffered 0 to 25% dieback and 16.7% of tufts had 25% to 50% dieback . Four months after the fire, density of weeping lovegrass averaged 15.8 plants/m² on unburned and 13.6 plants/m² on burned plots. By the 8th postfire month, densities were even more similar on burned and unburned plots . Soil water content was significantly lower and soil temperature was significantly greater on burned than unburned sites (P≤0.01). Soil water content in top 12 inches (30 cm) of soil was 31% and 61% lower on burned than unburned plots 4 months and 12 months after the fire, respectively. In January (5 months after fire), the highest surface soil temperature on burned plots was 120 °F (51 °C) and on unburned plots was 110 °F (42 °C) . Weeping lovegrass damage was slightly more severe 1 month after a backfire than after a head fire in grasslands in Blemfontein, South Africa. The head fire progressed an average of 6.7 times faster than backfires. Both fires burned on 30 August when the average wind speed was 7.5 feet (2.3 m)/s, air temperature was 61 °F (16 °C), and relative humidity was 42%. Fuel loads were 1,200 to 1,450 kg/ha and fuel moisture content was 18% to 21% [96,98]. Weeping lovegrass frequency was 1.5 times greater on burned than unburned sites. However, frequency may have been overestimated because fire split some tufts into 2. Time since fire was not reported for the frequency differences on burned plots, but botanical composition information was collected before and 1, 4, 8, and 20 months after fire during this study . Weeping lovegrass density was little affected by fire. There were an average of 20.3 weeping lovegrass plants/m² on unburned sites and 22.2 plants/m² on 20-month-old burned sites . The number of flowering tillers/weeping lovegrass tuft was nearly equal on burned and unburned sites, although the number of vegetative tillers was generally lower on burned than unburned sites. Weeping lovegrass seedling establishment was "heavily decreased by fire" . Weeping lovegrass is tolerant of repeated fire. During a long-term study of fire on Ukulinga Research and Training Farm grasslands in Natal, South Africa, relative abundance of weeping lovegrass on sites burned annually during the winter or dormant season was 0.53%. Relative abundance of weeping lovegrass on biennially and triennially winter-burned sites was 2.56% and 27.5%, respectively. On sites undisturbed for 50 years, weeping lovegrass relative abundance was 18.41% . Fuels: Researchers have noted weeping lovegrass persistence on annually burned sites [42,74,119], suggesting that fine fuel production is sufficient to carry annual fires in weeping lovegrass stands. Litter is "pronounced" in weeping lovegrass monocultures  and accumulates in and around the base of weeping lovegrass plants and around weeping lovegrass root crowns the longer stands are undisturbed . Fire behavior in nonnative habitats: Fire behavior has been described in weeping lovegrass stands in Texas and in velvet mesquite (Prosopis velutina)-desert grasslands in southern Arizona. Fire behavior varied widely during spring prescribed fires (24 head fires and 12 backfires) in weeping lovegrass stands in north-central Texas. Fireline intensity ranged from 75 to 4,706 btu/ft/s. Fuel consumption varied by a factor of 2, and rate of forward spread varied by a factor of 40. In the spring, a minimum total fuel load of 3,308 kg/ha was necessary for successful fire spread. Successful fires spread at 0.3 to 2 miles (0.04-3.4 km)/hour. During the fastest fire, the air temperature was 88 °F (31 °C), relative humidity was 14%, and wind speed averaged 45 km/hour [18,19]. Researchers evaluated fire behavior following a 2002 wildfire in velvet mesquite-desert grasslands in the Sonoita Valley of southern Arizona, where large areas are dominated by weeping lovegrass. The fire burned from 29 April to 2 May when the air temperature was 81 °F (27° C), wind speed averaged 30 to 37 miles (50-60 km)/hour, and relative humidity was less than 10%. Using computer modeling and information from burned sites, researchers estimated that the fire produced scorch heights of up to 200 feet (60 m) and a fireline intensity of up to 7,500 kW/m . Fire regimes: Weeping lovegrass may experience high fire frequency in its native and nonnative habitats. In the 900-km² Hluhluwe-Umfolozi Park dominated by weeping lovegrass in northern Kwa-Natal, South Africa, the average fire-return interval is 3.8 years. Fire frequency depends largely on fire management policies but also depends on fuel loads, which depend on rainfall. Fire frequency and size were evaluated from 1,111 fire records from 1956 to 1996. In the Park, all but 1 study site had a fire-return interval of 4 years or less. On average, 26% of the park burned each year, and fire size averaged 9.1 km². In the 40-year period, less than 1% of the Park burned only once and another 1% burned more than 20 times. Most fires were ignited by park staff in spring. There were only a few lightning fires and those burned in the summer. Larger areas burned in wet than dry years due to increased grass fuel loads, which increased fire spread potential [5,7]. Before European settlement and the introduction of weeping lovegrass in the Great Plains region of the United States, level to rolling grasslands may have burned every 5 to 10 years and areas with rougher topography may have burned every 20 to 30 years. In the Great Plains, where weeping lovegrass has now been widely introduced, "big" fires tend to occur in drought years that follow at least 2 years of above-average precipitation. If fuels are abundant and continuous, wind speeds and air temperatures are high, and relative humidity is low, fires may spread many miles. Several factors associated with European settlement, such as heavy grazing and cultivation, decreased the fuel availability and fuel continuity in desert grasslands and led to decreased fire frequency [109,132]. Introduction of nonnative grasses, however, may have had the opposite effect on fuel availability, fuel continuity, and possibly fire frequency. Although no studies directly measure fuel or fire behavior differences between weeping lovegrass-dominated and native-dominated desert grasslands, several studies report on stand structure, development, and growth differences between lovegrasses and native grasses that could influence fire behavior and fire regimes. Stand structure is often different in native-dominated and lovegrass-dominated grasslands. Lovegrass-dominated grasslands are dense and capable of supporting fire spread, while native grasses are generally discontinuous and less conducive to fire spread . Several researchers have noted increased weeping lovegrass seed production and plant abundance on burned sites [59,68,74,84], which a review  reports is rare for native desert grassland species. The review suggests that postfire increases in plant abundance and reproduction could support increased fire frequencies. Given these differences in native- and lovegrass-dominated grasslands, fire frequencies may increase and fire behavior may be different with increased abundance of nonnative lovegrasses. Along highways near Perth, Australia, sclerophyll woodlands where weeping lovegrass is common burned at 10- to 20-year intervals. Ten-year fire-return intervals were most common (van der Moezel and others 1987 as cited in ). See the Fire Regime Table for further information on fire regimes of vegetation communities in which weeping lovegrass may occur. Find further fire regime information for the plant communities in which this species may occur by entering the species name in the FEIS home page under "Find Fire Regimes". Potential for postfire establishment and spread: Weeping lovegrass can establish from seed on burned sites [15,78]. Although weeping lovegrass seed dispersal is limited, if stands occur near burned sites, there is high potential for establishment on burned sites. In recent years, weeping lovegrass has been intentionally seeded on burned sites  and in other revegetation efforts [32,118], making it virtually impossible to control weeping lovegrass populations and spread in these areas. For more detailed information on these topics see the following publications: [6,14,46,107]. Prescribed fire as a control agent: Prescribed fire is not a likely control agent for weeping lovegrass. Establishment of weeping lovegrass is often increased by removal of litter. However, fire frequencies at less than 5-year intervals may damage plants , although this did not occur in South Africa . During fire studies designed to determine how best to use fire to encourage weeping lovegrass growth, a researcher found that summer and winter fires can decrease productivity and late-spring fires may kill seedlings. Plant damage was most likely when soils in weeping lovegrass stands were dry and litter had built up in plant crowns . Cattle and deer feed on weeping lovegrass in its nonnative US range. Several small mammals and birds utilize weeping lovegrass habitats, although species richness and abundance may be higher in native grasslands than in weeping lovegrass stands. Cattle: Most researchers indicate that cattle graze weeping lovegrass primarily in the spring. In Arizona, cattle preferred weeping lovegrass over associated native grasses in the spring . Hoover and others noted that weeping lovegrass was eaten "readily" by cattle in the spring but eaten "sparingly" in the summer . Diggs and others reported that weeping lovegrass was not grazed by cattle when more palatable species were available, but noted that when more palatable species were not available, weeping lovegrass may be grazed nearly to ground level . Cattle can become tender footed if made to walk on the hard stubble that remains in heavily grazed weeping lovegrass stands (Standford, personal communication cited in ). See also Palatability and nutritional value. Deer: In the winter in the southeastern United States, white-tailed deer feed "considerably" on weeping lovegrass . Small mammals: In a near monoculture of weeping lovegrass in Lynn County, Texas, researchers captured 8 small mammal species. Captures of deer mice and hispid pocket mice were most common in areas with low (30-36%) weeping lovegrass cover, and captures of hispid cotton rats and western harvest mice were most common in areas with high (56-69%) weeping lovegrass cover . In the Appleton-Whittell Research Ranch in Arizona, most rodent species (western harvest mice, hispid cotton mice, and northern pygmy mice) were significantly (P<0.05) more abundant in native grasslands than in nonnative lovegrass stands. However, the most abundant rodent, the hispid cotton rat, was significantly (P<0.001) more abundant in lovegrass stands than native grasslands . Birds: Southwestern bird species were often rare in weeping lovegrass stands or preferred native grasslands over weeping lovegrass stands. Although most bird species were more abundant in native desert grasslands than in lovegrasses on the Appleton-Whittell Research Ranch, Botteri's sparrow was counted more often in lovegrass stands than in native desert grasslands (P<0.001) . Bird nest densities were low in weeping lovegrass stands in central Lynn County, Texas, relative to native grasslands. Researchers located Cassin's sparrow, mourning dove, and common nighthawk nests. Drought conditions (33-57% below average precipitation) prevailed during most of the study . In the southern High Plains of Texas, the grasshopper sparrow was abundant in weeping lovegrass stands . Insects: Weeping lovegrass stands support diverse, abundant, and rare insect populations throughout its southeastern and south-central US range. In Oklahoma, Elateridae and carbid beetles foraged in the "pronounced" litter layer in weeping lovegrass monocultures . In a weeping lovegrass field on the Texas Tech University Farm, researchers found a variety of arthropod families and species utilizing weeping lovegrass habitats . During several entomological surveys in the southern United States, researchers collected a diversity of insects in weeping lovegrass stands. Seldom collected cinch bug (Blissus minutus) adults and nymphs were collected often from weeping lovegrass plants in Florida, Georgia, North Carolina, South Carolina, Oklahoma, and Texas, although this cinch bug was only previously known from Florida. Another rarely collected cinch bug (Toonglasa umbrata) was collected often in weeping lovegrass plants in Arizona, New Mexico, Oklahoma, and Texas . A seed bug (Ligyrocoris slossoni) was collected from dead weeping lovegrass stems in Lake County, Florida. This seed bug was last collected in the 1940s . Plant hopper (Amycle vernalis, Cyrpoptus belfragei, C. reineckei, and Rhynchomitra microrhina) nymphs were collected from weeping lovegrass in the southeastern and south-central United States. Researchers noted that insect use of weeping lovegrass as food and habitat may be relatively recent . During studies in the Southeast, rarely collected turtle bugs (Oncozygia clavicornis and Allopodops mississippienses) were found on weeping lovegrass. The researcher noted that dense weeping lovegrass crowns likely offered insect protection. These turtle bugs represent monotypic genera that may or may not be rare. Little information is available on the ecology or abundance of these insects . Palatability and nutritional value: Although the palatability and forage quality of weeping lovegrass typically decrease as plants approach maturity , as the growing season progresses, or during drought conditions , management activities may improve or maintain palatability and/or nutrition. Some suggest that grazing and fire can be used to maintain weeping lovegrass palatability. Management guidelines for maximum production and livestock weight gains are provided by Dahl and Cotter . At the Texas Tech University Research Farm, cattle utilization and crude protein of weeping lovegrass were greater on winter- or spring-burned than on unburned plots . Crude protein content was greater and neutral detergent fiber was lower on spring-burned than unburned sites for nearly all of the first postfire season in Texas . On other sites in Texas, weeping lovegrass crude protein and digestibility were greater on clipped than unclipped vegetation 30 days after clipping . Weeping lovegrass palatability and nutrition can vary by ecotype or cultivar . For more on the palatability and nutrition of weeping lovegrass, see the review by Crider . For information on the forage quality of weeping lovegrass cultivars harvested at different times, see Voight and others . Cover value: Weeping lovegrass was often introduced into the United States to reduce soil erosion along roadsides, in overgrazed grasslands, and on severely disturbed sites. This topic is discussed more in the Distribution and Occurrence and Introduction and spread sections. Weeping lovegrass monocultures are said to provide excellent cover for rabbits and better-than-average cover for quail (review by ). However, Abbott and others  reported that weeping lovegrass stands on the southern High Plains of Texas, "appear to have limited value for wildlife", especially quail, because stands typically lack woody vegetation. Introduction and spread: Because weeping lovegrass establishes easily and grows rapidly on harsh sites, it was seeded or planted on mine spoils, along roadsides, active sand dunes, and severely disturbed sites nearly throughout the United States. In some seeded areas, weeping lovegrass has not spread far from its introduction site, but in others, it has expanded its range into natural and sometimes sensitive habitats. 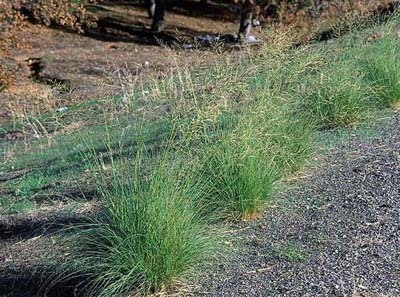 Site characteristics that allow for or promote weeping lovegrass spread were not described in the available literature as of 2009. Mines: Weeping lovegrass can rapidly provide ground cover on mine sites. It tolerates extremely acidic soils and the presence of many heavy metals. Some report that weeping lovegrass escapes easily from mine sites , while others indicate that it "gradually gives way to other perennial species" . 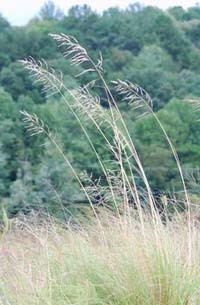 On abandoned manganese mine lands in southwestern Virginia and northeastern Tennessee, weeping lovegrass cover was considered excellent soon after seeding. These mines were a major source of nonpoint source water pollution, which weeping lovegrass helped to decrease . On a coal mine spoil in southeastern Kentucky, weeping lovegrass provided most of the early cover, but 3 to 4 years after seeding, tall fescue (Schedonorus arundinaceus) and lespedeza (Lespedeza spp. ), which were also seeded, dominated the site and were "crowding out" weeping lovegrass . When topsoil collected from a mixed-deciduous forest was used in the revegetation of a mine spoil in Campbell County, Tennesse, Wade  found that subsequent seeding of nonnative species such as weeping lovegrass decreased the success of native species emerging from the top soil. Roadsides: The New York State Department of Transportation planted weeping lovegrass along Long Island highways from the 1960s through the 1980s. As of 2000, weeping lovegrass has become established on dry sandy soils in Suffolk County. It has formed monocultures in late-seral old fields and occurs in maritime grasslands in Shinnecock Hills, which are considered a globally rare ecosystem by the New York Natural Heritage program . Unstable sand dunes: During mismanagement of sandy sites in Vermont, trees and other vegetation were removed. Because the sand was actively moving, these sites proved exteremely difficult to revegetate. After many seeding and planting failures, researchers in the 1940s planted weeping lovegrass on these sites. Weeping lovegrass grew rapidly and produced a thick mat of roots . Severely disturbed site: Although not intentionally planted, weeping lovegrass established and produced greater than 1% cover after a seed mix was used in the interior of Hawaii's severely disturbed Kaho'olawe Island in 1988. Weeping lovegrass was likely a contaminant in the seed mixture. Kaho'olawe Island has a long, severe land-use history that includes island warring, slash-and-burn agriculture, overgrazing, and military training. It is the windiest Hawaiian island and receives only 20 inches (500 mm) of annual precipitation. As of 1916, about 30% of the island was "completely denuded", up to 1 foot (3 m) of topsoil was lost, and in the study area, plant cover was less than 2% . During a second revegetation phase in 1990, researchers intentionally seeded weeping lovegrass, which averaged 17% cover by 1996 . Reports vary regarding weeping lovegrass' potential to spread from its introduction site. In a 1988 review, Cox and others  report that weeping lovegrass "does not actively colonize adjacent nonplanted sites". In the Apache Highlands ecoregion of Arizona and northern Mexico, the distribution of weeping lovegrass in 2005 approximated the area where it had been seeded in the 1930s . On the Appleton-Whittell Research Ranch in Arizona, weeping lovegrass that was seeded in 1949 had not spread "far beyond" where it was originally seeded by 1999 (Bock, personal communication cited in ). Although weeping lovegrass was planted along roadsides for erosion control in the Carolina Sandhills National Wildlife Refuge, it had not invaded native plant communities there as of 1998. The planting date was not reported . When weeping lovegrass was seeded on bare, severely eroded sites with infertile, strongly acid subsoils in southeastern Tennessee in the 1940s, the researcher noted that it was "expected to persist and develop greater density, but not to spread beyond the seeded area" . In a 2002 publication, Stevens and Ayers  report that weeping lovegrass has "recently erupted" along the Colorado River in the Grand Canyon region, and in a 1982 review, Wasser  reports that weeping lovegrass has a "strong competitive ability" and may become "weedy without management". Impacts: Rapid emergence and establishment imply that weeping lovegrass may negatively impact associated vegetation. Persistence of weeping lovegrass suggests that wildlife impacts are possible as well. Following a controlled study, researchers considered weeping lovegrass an "aggressive" species because of its rapid emergence compared to 11 predominantly nonnative grasses and legumes. In a greenhouse study, weeping lovegrass emergence was high at both 70 °F (21 °C) and 82 °F (28 °C) and reached a maximum 1 to 4 days after seeding. Of the 11 species tested, only weeping lovegrass emerged by day 2 at 70 °F (21 °C) . However, in another greenhouse study, weeping lovegrass seedlings averaged only 3 mg of dry weight 90 days after seeding. This growth was much lower than that of other nonnative pasture species such as subterrranean clover (Trifolium subterraneum), common tussock grass (Poa labillardieri), and bulbous canarygrass (Phalaris aquatica), which averaged 18 to 78 mg of dry weight . After multiple studies of planting, growing, and grazing weeping lovegrass, Dalrymple  considered established weeping lovegrass plants "very competitive to weedy competition". Vegetation: Several studies conducted on the Appleton-Whittell Research Ranch in Arizona indicated lower vegetation diversity in lovegrass (Lehmann lovegrass and weeping lovegrass) stands than in native grasslands or shrublands. During a study in 1984, researchers found that cover of native blue grama, native plains lovegrass (Eragrostis intermedia), native forbs, and native shrubs was significantly (P<0.05) greater in areas without lovegrasses. Forb richness and shrub density were also significantly (P<0.05) greater in areas without lovegrasses . In a 1999 study, researchers compared plant species richness in oak (Quercus spp.) savannas, native grasslands, and weeping lovegrass stands. In oak savanna plots, total plant species richness was as high as 134, in native grassland plots was 100, and in weeping lovegrass plots was 58. Native species dominated all plots; there were only 4 nonnative species in all plots. Researchers suggested that superior competitive ability, allelopathy, or earlier initiation of growth in weeping lovegrass could explain the absence of many species from weeping lovegrass plots . When seed banks were compared in burned weeping lovegrass stands and native grasslands in the same area, total seed bank density and seed bank richness were greater in native than in weeping lovegrass grasslands . Wildlife: Several birds and small mammals utilize weeping lovegrass habitats, but often use is lower in weeping lovegrass than in native habitats. Areas seeded to weeping lovegrass in Texas as part of the conservation reserve program to reduce soil erosion are considered important habitat for arthropods, which are important to grassland birds . On the Appleton-Whittell Research Ranch in Arizona, total grasshopper abundance was 44% lower in lovegrass-dominated than in native grasslands, but the largeheaded grasshopper (Phoetaliotes nebrascensis) was significantly (P<0.02) more abundant in lovegrasses than in native grasses . The importance of weeping lovegrass to insects is discussed more in Insects. On the 3-Bar Game Management Area on the Tonto National Forest, breeding bird species richness and density were greatest in willow (Salix spp. )-dominated riparian sites, followed by chaparral vegetation. Lovegrass-dominated grasslands supported the lowest breeding bird species richness and diversity . On the Appleton-Whittell Research Ranch, total bird counts in lovegrasses were about half those in native desert grasslands (P<0.001). Scaled quail, northern mockingbirds, loggerhead shrikes, Cassin's sparrows, Brewer's sparrows, vesper sparrows, grasshopper sparrows, and eastern meadowlarks were all significantly (P<0.01) more abundant in native grasslands than in lovegrass-dominated grasslands. However, Botteri's sparrow preferred lovegrass habitats . Most rodent species on the Appleton-Whittell Research Ranch were significantly more abundant in native grasslands than in lovegrass-dominated grasslands (P<0.05), although the most common rodent, the hispid cotton rat, was significantly more abundant in lovegrasses than in native grasses (P<0.001) . For more on animal use of weeping lovegrass, see Importance to Livestock and Wildlife. Control: As of 2009, very few references provided information on the control of weeping lovegrass. On sites where weeping lovegrass was introduced to reduce erosion potential its removal may lead to increased erosion. At Arizona's Tonto National Monument, removal of weeping lovegrass would likely trigger erosion, so Phillips  suggested mowing or clipping plants to deplete the seed bank, while seeding native species to promote the replacement of weeping lovegrass by native species. Fire: For information on the use of prescribed fire to control weeping lovegrass, see Fire Management Considerations. Prevention: It is commonly argued that the most cost-efficient and effective method of managing invasive species is to prevent their establishment and spread by maintaining "healthy" natural communities [64,94]. This may be best done by discontinuing the use of weeping lovegrass on disturbed or burned sites. Managing to maintain the integrity of the native plant community and to mitigate the factors enhancing ecosystem invasibility is likely to be more effective than managing solely to control the invader . The following table provides fire regime information that may be relevant to weeping lovegras habitats. Find further fire regime information for the plant communities in which this species may occur by entering the species name in the FEIS home page under "Find Fire Regimes". Fire regime information on vegetation communities in which weeping lovegrass may occur. This information is taken from the LANDFIRE Rapid Assessment Vegetation Models , which were developed by local experts using available literature, local data, and/or expert opinion. This table summarizes fire regime characteristics for each plant community listed. The PDF file linked from each plant community name describes the model and synthesizes the knowledge available on vegetation composition, structure, and dynamics in that community. Cells are blank where information is not available in the Rapid Assessment Vegetation Model. Surface or low: Any fire that causes less than 25% upper layer replacement and/or removal in a vegetation-fuel class but burns 5% or more of the area [48,62].